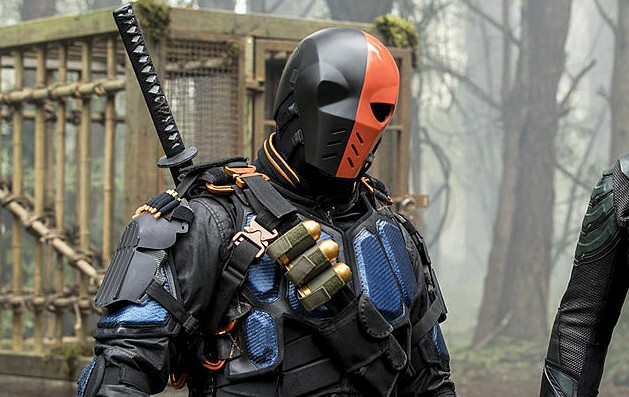 Well, it was nice while it lasted to have Manu Bennett play Slade Wilson on the CW's Arrow for the last two seasons, but now, he's off the table for the TV show. Turns out that now that DC has a film with Deathstroke in it, being played by Joe Manganiello, the company has told The CW that can no longer use the character on the small screen. This quote wasn't used in this report, but I've seen the statement made that when characters are used on the big screen, they restrict their usage from the small screen so as to not confuse the fans who watch both. As if we're f*ing idiots or something. Though to be honest, I have always wondered why some actors are tagged to play a character on TV aren't also tagged to play the same character on the big screen? Now Deathstroke showed up in the mid-credits seen of the Justice League movie, and people are wondering when we'll see him next. Our first guess was in the solo Batman film, but that's up in the air, and in the mid-credits scene, he was talking to Lex Luthor about pulling together their own group of bad guys to counter the Justice League. So maybe Deathstroke will show up in a different film now, but we'll have to wait to see what happens, considering that WB is completely restructuring their DC production team because their products are not making the billions they want them to. Bottom line... bah bye Deathstroke... see ya in the theaters!